While I agree that these discussions should be individualized, I’m a little unclear what numbers the authors are looking at in this article that would possibly give the impression of a relatively high survival among these patients. Indeed this would be seriously misleading statement if said this way to patients when having "discussions about advance directives". The good news is that I’m not alone in my objections. Some very smart individuals took the authors of this article to task over the rosy picture they were presenting on the outcomes of CPR. In two separate letters to the editors, Bradford Glavan & William Ehlenbach, and Yee & Newman argue that the presentation of overall survival estimates on the basis of survival to hospital discharge was misleading (see here). Dr. Newman also was kind enough to send me some pictures to back up this argument. 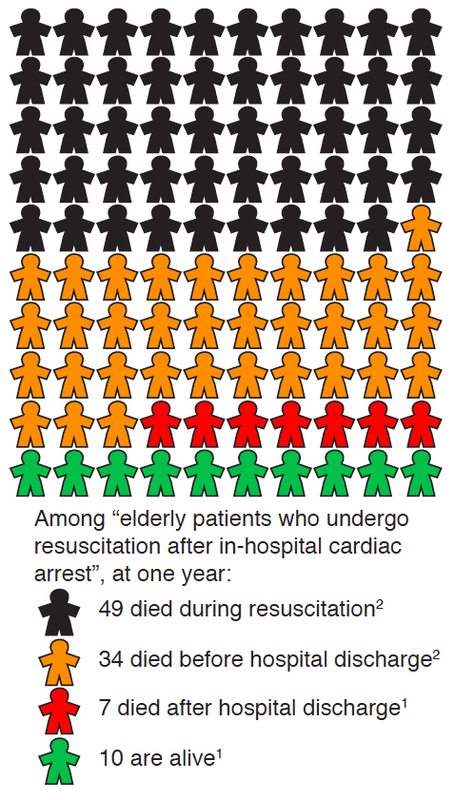 In this chart, one in two elderly patients die during the resuscitation attempt. One out of six survive to leave the hospital alive. 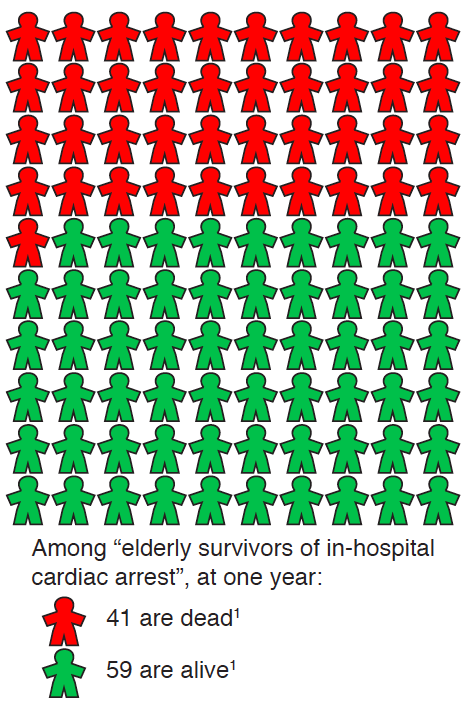 Nine out of 10 are dead within one year of the in-hospital cardiac arrest. This leaves us with only one out of 10 alive at one year after an in-hospital resuscitation attempt. Anyone still left with a view that there is a “relatively high survival rate” for this population? If so, then just look at the data for survival to hospital discharge with good neurologic function or minimal deficits based on study results from an article in this week in JAMA Internal Medicine. When done in journal club, the general response of the internal medicine residents commenting reflected being misled by the commentary/discussion. They missed the big picture (pointed out by the LOEs). Excellent write up Eric - We need to spread this to a very wide audience. I think the pictures are extremely helpful in understanding this research concept. But then so many American parents think their kid is going to be the next superstar, so maybe that isn't the best example of risk prediction. Well that is what I get for trusting the Business Insiders Math. Agree that NEJM article articulates shockingly misleading conclusions which could set back CPR discussions a further 100 yrs! Newman's graphics make sense, but to the parent whose child will be exceptionally the next superstar, or to the patient who thinks they'll be in the <10% who survive cohort, autonomy/choice model still risky as could end up with ICUs full of the 90% ... My own practice & teaching is based on the "informed assent" model - see Chest 2007;132 Point: The Ethics of Unilateral “Do Not Resuscitate” Orders: The Role of “Informed Assent” Counterpoint: Is It Ethical To Order “Do Not Resuscitate” Without Patient Consent? and JAMA 2012 Blinderman, et al. Thank you for this articulate and elegantly simple take on this issue. The pictograms are particularly effective at conveying the message. However, I think we risk doing our frail patients (and their loved ones) a grave injustice when we continue to fixate on mortality statistics as the most compelling argument for DNR status. As you've alluded to here, survival with neurologic damage is a very real - and very frightening - possibility after in-hospital arrest. In my experience these kind of "fate worse than death" risks are more potent motivators for frail elders, many of whom have already made peace with the concept of their own mortality. You ask about patient understanding and goals. You not only allow your own biases, but declare them. After making sure that the patient/family is informed (and understand your view to the extent that you feel it appropriate to tell it to them), then it's now your job to advocate for the plausible medical plan that is consistent with their goals and understanding. You don't ask a laundry list of questions, you elicit goals and then make medical recommendations. "It sound like...based on that, I'd recommend...Does that sound right?" Assess for discord, if it exists, then lather, rinse, repeat. Often end up with a time-limited trial here (when a checkbox plan would have led to a full-medical/technological-support plan without any strategy if things go south, which is what many of us dread). This misleading idea is still alive and kicking. One of my geriatrics colleagues recently went to a Palliative Care (!?) 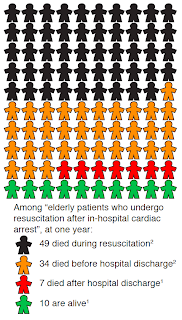 for generalists conference where an intensivist was strongly arguing that we should be presenting a much rosier picture of CPR and used this Chan study as the main argument. My colleague is smart. But she was fooled by the presentation. She talked about it at a geriatrics didactics session. Once I pointed out the very weird way the data was presented (% of those who survived to hospital discharge who were alive at a year) and the comparison to heart failure (I cannot come up with a charitable explanation for why this comparison was made), she felt that she had been misled pretty badly at the conference. We could go further than Yee/Newman do. 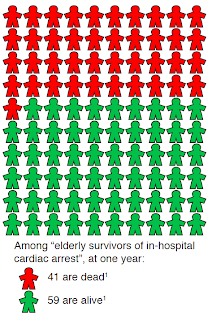 "Among elderly patients who undergo resuscitation after in-hospital cardiac arrest, less than 10% are alive at 1 year, and most of them will have serious neurological deficits." 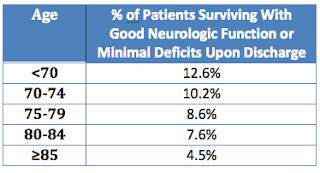 The functional deficit really matters to some of our patients. They might opt for a resuscitation effort if there were a good hope that they would return to their baseline functional status, but they would not want to opt for this CPR effort if they understand that most of the already small percentage of survivors of CPR their age end up with serious functional deficits.